I own a purebred German Shepherd Dog named Nuke. He's a fully-intact male dog of sable color, with extremely large paws. He was born on a family farm in Rogersville, TN, along with his five brothers and sisters. I found him in the barn during early spring, around March, while visiting the farm for the week. He was about a week old at that time. I took Nuke, as well as his siblings, to my great grandmother and she told my uncles to build a dog house for all of them. I gave all the puppies a good bath in a big tub on the back porch. Later that night, I fed all the pups and their mother beans and cornbread for dinner; Nuke would eventually "be raised" on table scraps, along with the occasional bowl of kibble. Since I couldn't take them all home to my farm when it was time for me to go home, I decided to leave my Nuke and his siblings on the family farm. My great grandmother, knowing I favored Nuke, later brought him all the way to my farm for me about 2 and a half months later. That was the first time he'd ever ridden in the car; I was told he didn't whine or get sick the whole way, which impressed me very much since he was such a young puppy. My mother and our other dog weren't too thrilled about Nuke at first, but he eventually grew on mom. My dad loved him right from the start. I carried him around with me everywhere around the farm that first day; from the pasture to the barn and everywhere else in between. And when I put him down, he didn't even chase our chickens, goats, or horses. He did love to chase groundhogs and foxes, though. I only remember him ever killing one animal, and he was about four months old at that time; a neighbor's chicken. Nuke was a very protective German Shepherd; he protected the farm religiously, especially after dark. I remember one time, when a friend of mine and I ran away and the police came, he attacked the police officer who found us. Bit right through that cop's hand! And at 5 months old, he proved his worth times over by attacking and chasing off some robbers. They had been trying to steal our cows and horses, but Nuke got the better of them; he chased them far away from our farm and returned with some blood on his lips and in his mouth, clear evidence of his victory. Nuke's a bit older now, but still the best dog I've ever had. There are two types of dog you know. You always know where you are with a shepherd. Theyre more trusting than a human. 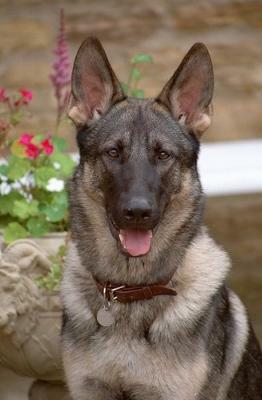 You gotta love those German Shepherds, they are Great and was Nuke!!! Nuke! Great name for a great dog. Loved your story! The loyalty and devotion of GSD continues to amaze me. I've had a GS most of my life...I'm with number 5 now (Max). He's a lot like Nuke. I don't know about the best dog but he certainly fits, "BEAUTIFUL"!